I’ve written a fair amount on what happened to me on September 30th 2010, so much so that I’d long ago decided that enough had been written. I was suprised to learn recently that I haven’t shared the full story, at least not here on this blog. This will hopefully answer all the questions you might have, or at least leave you with the same ones I have. If you do have more questions feel free to leave a comment, and I might be able to help out. The truth of the matter is I really don’t know why the rear wheel of my well maintained F800S locked up while going 70mph in a straight line. Let’s look at what I do know and maybe draw some conclusions from that. The bike had ABS, meaning that I couldn’t have accitently locked the rear on my own. It took two or three guys to push my bike off the freeway because the rear wheel wouldn’t move after the crash. After the belt was cut off and the engineers from my insurance company looked at it the rear wheel did turn. The rear wheel locked up and I fishtailed for a few seconds until I highsided. I think something mechanical in the rear wheel seized and caused the rear wheel to lock. I forgot my MSF training and instead of just braking as hard as I could with my front brake and try to stop as fast as possible I tried to ride it out. Somehow the rear unlocked for a second or something else caused me to high side, since the next thing I remember is tumbling down the road. This is all guess work however. I couldn’t find a lawyer willing to take the case, and with everything else that was going on (broken arm, badly broken leg, missing work etc.) I gave up once my very own insurance company somehow decided it was my fault. In hindsight, maybe I’d do things differently. I try not to dwell on the past, I’ve learned from my mistakes and am moving on. I’ll just never buy BMW again. 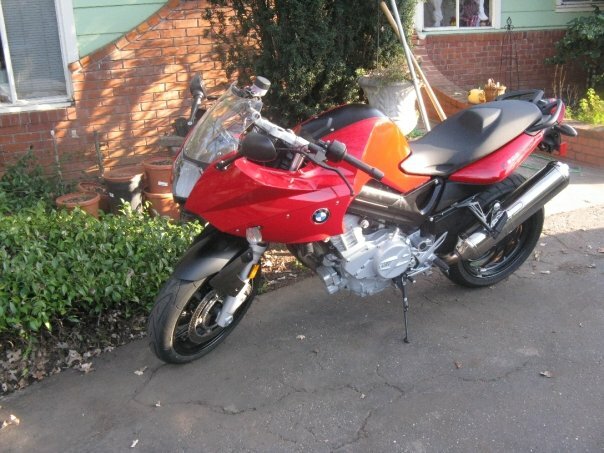 The bike on the day I got it. Too bad I couldn’t see the future… might have done it differently. This entry was posted in Life, Motocycling, motorcycle, Motorcycles, Riding and tagged bmw f800s, bmwf800s, crash, crash 093010, moto. Bookmark the permalink. Thanks for filling in your theories and glad that you’re around to share the experience. No Problem. I’m happy to answer questions about all the random that I write. I’m glad I made it too. There was a split second as I was tumbling down the freeway that I wasn’t so sure I was going to make it. I must admit your story really scared me out. I am writting from France and I bought my BMW F800S just like you, recently. This is a fourth-handed bike, first realeased in 2007. More than 40 000km (24854,848 miles). I don’t want to force you to talk about that once again if you don’t wish to. If you have any tips to give me about the bike maintenance. What I have to watch ou, maybe now, with even more hindsight you can help me to avoid the same problem. Maybe I have trouble with the translation of mechanical terms. If I did understand well, it was the belt that block when you were riding, wasn’t it? Hope to have news from you. Since my accident they did a recall on the rear wheel bearings. Which I suspect was the reason for the crash. Make sure you talk to the local dealer about it and have them look at the bearings. Hopefully this translates well. Feel free and ask questions. I don’t mind talking about it.